John Piper says, "As Christians, we care about all suffering, especially eternal suffering." Live Global partner Bijaya and his evangelism team in Nepal agree with this statement and take it to heart as they work throughout the remote villages in their country. A blanket ministry is a profound way for Bijaya and his team to reach the hearts and lives of people during the difficult winter season in the mountains. They gather hundreds of blankets and drive them to remote villages in the mountains where they distribute them to people who need something warm. 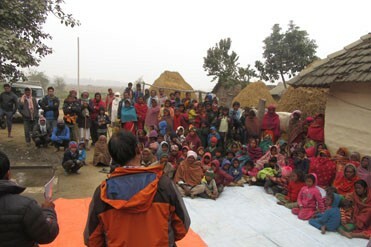 On their most recent trip, they delivered 260 blankets in four different villages. Of those who received blankets, new mothers were some of the most grateful! But to give out a warm blanket to relieve earthly suffering without considering the person's eternal destiny would be a great disservice. 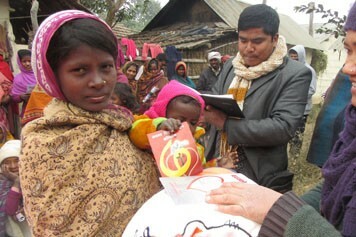 By God's grace and provision, Bijaya never neglects to give out gospel tracts and Bibles and to preach the good news of Jesus whenever he makes a trip. Bijaya said, "Every one of them got copies of God's Word. It was really great to show God's love to them in both ways." Most times Bijaya and his team share the good news with people who have never heard it—people who come from many different backgrounds.